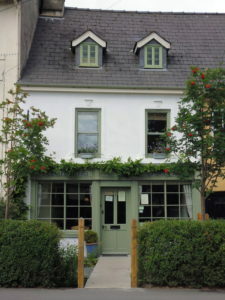 to our small and friendly Bed and Breakfast in Brecon town. Our accommodation is located just across the river from the town centre, so all the facilities of town are within 10 minutes walk. We have very easy access to the Brecon Beacons, by car, on foot, or by bicycle. Our aim is to offer relaxed B and B accommodation for people coming to enjoy the outdoors. 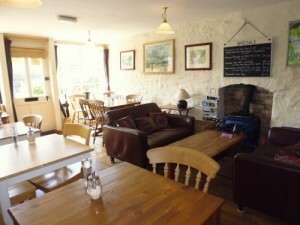 The old cafe makes a comfortable guest lounge, and the ideal space to make good food and drink available for our guests. We have been providing comfortable rooms for walkers, hikers and cyclists since 2005, so we know the area well. When not cleaning the rooms or cooking breakfast we love getting out on the hills ourselves. 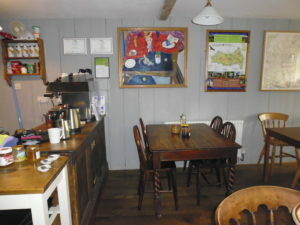 The cafe is no longer open to the general public for meals, but we do offer packed lunch and dinner to our B&B guests if wanted and ordered in advance. We are both “Ambassadors” for the Brecon Beacons National Park and the Fforest Fawr UNESCO Geopark. This means we have taken time out to train on our heritage, landscape, geology and wildlife. are easily accessible hills, with the highest point Pen y Fan at 886m. 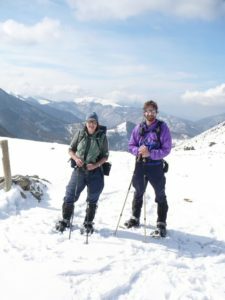 There are dozens of walks either up to the summits or in green valleys and wooded areas. The western area includes spectacular waterfalls and ancient woodland. See our Things to do page for more information.